To begin with Eggless Whole Wheat Banana Muffins, firstly sift the flour, baking powder, powdered sugar and salt and mix them in a bowl. Keep it aside. In an another bowl, mash the bananas by hand or with a fork. Add vegetable oil and milk and whisk well. You can use hand mixer too for mixing. Add cashew-nut pieces and mix everything well. Pre-heat the oven for 5 Minutes at 175 degree C in convection mode. Line the muffin tray with cupcake covers and fill them with the prepared batter. Fill only till 3/4th of the cupcake cover and leave some space as the muffins will rise. Bake them for about 25-30 minutes. Keep checking after 20 minutes that the muffins are ready or not. To check if the muffin is baked, pierce a toothpick at the centre of the muffin. If the toothpick comes out clean, then it is baked properly. Otherwise, bake it for another 5 minutes. Serve Eggless Whole Wheat Banana Muffins with hot Masala Chai and Grilled Spicy Potato sandwich for your tea time parties. Wondering what to do with ripe bananas? No, do not discard them. 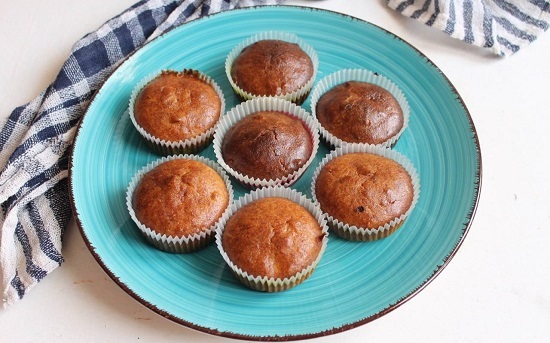 Instead make these healthy, delicious and nutritious Eggless Whole Wheat Banana Muffins. This recipe can be prepared with ingredients which are normally available in everyone's kitchen. These can be packed in the kids snack box too as the taste of banana will make the child eat these muffins.